Sandra Bland – who was vocal on the issue of police encounters with African Americans in the months leading up to her death in a jail cell in Texas -- had at least 10 encounters herself with police in both Illinois and Texas in past years. 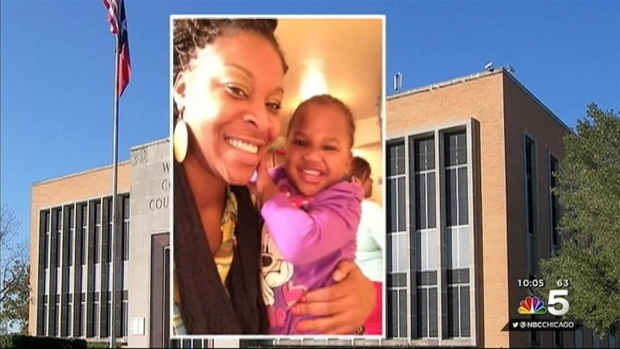 And NBC5 Investigates has found that – at the time of her death last Friday -- she still owed a total of $7,579.00 in court fines resulting from five traffic stops in various Chicago suburbs (including a DUI), and she had been cited several times for her failure to pay those fines. Sandra Bland, 28, of suburban Villa Park, was found hanged in her jail cell Monday morning in the Waller County Jail located about 50 miles from Houston. NBC Chicago's Lauren Jiggetts reports. Friends and family have questioned the official version of Bland’s death, noting that she was due to start a new job at a local college this week. 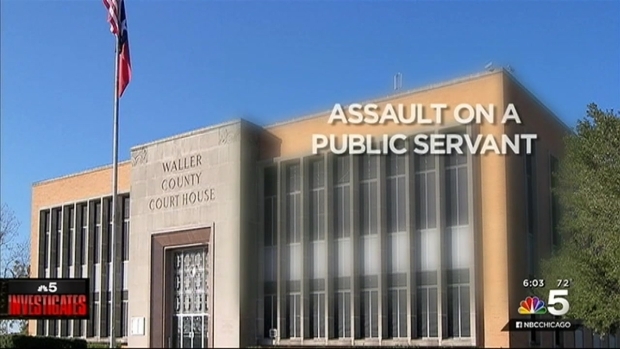 Waller County District Attorney Elton Mathis said he will present the findings of an investigation by the Texas Rangers to a grand jury. March of 2013 – Bland was stopped in Crestwood Township while driving a 2013 Cadillac DeVille and received two citations – for speeding 21-25 mph above the limit, and for operating an uninsured motor vehicle. She was fined $200, which – according to Cook County Court records – has not been paid. November of 2013 – A report in a suburban newspaper says that Bland was arrested in Naperville; charged on a warrant, and transported to DuPage County Jail. The news report does not say what the warrant was for. February of 2014 – Bland was stopped by Lombard Police and charged with operating an uninsured motor vehicle and driving with expired license plates. 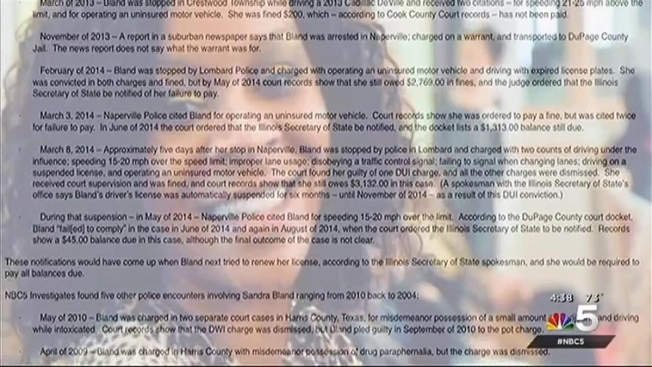 She was convicted in both charges and fined, but by May of 2014 court records show that she still owed $2,769.00 in fines, and the judge ordered that the Illinois Secretary of State be notified of her failure to pay. Sandra Bland, 28, of suburban Villa Park, was a graduate of Willowbrook High School. She traveled last week from Chicago to Waller County Texas, where she was scheduled to begin a new job at a local college. On Monday, she was found dead. NBC Chicago's Phil Rogers investigates. March 3, 2014 – Naperville Police cited Bland for operating an uninsured motor vehicle. Court records show she was ordered to pay a fine, but was cited twice for failure to pay. In June of 2014 the court ordered that the Illinois Secretary of State be notified, and the docket lists a $1,313.00 balance still due. During that suspension – in May of 2014 – Naperville Police cited Bland for speeding 15-20 mph over the limit. According to the DuPage County court docket, Bland “fail[ed] to comply” in the case in June of 2014 and again in August of 2014, when the court ordered the Illinois Secretary of State to be notified. Records show a $45.00 balance due in this case, though a court spokesman says the actual amount owed is $165.00. The outcome in this case is not clear. These notifications would have come up when Bland next tried to renew her license, according to the Illinois Secretary of State spokesman, and she would be required to pay all balances due. May of 2010 – Bland was charged in two separate court cases in Harris County, Texas, for misdemeanor possession of a small amount of marijuana and driving while intoxicated. Court records show that the DWI charge was dismissed, but Bland pled guilty in September of 2010 to the pot charge. April of 2009 – Bland was charged in Harris County with misdemeanor possession of drug paraphernalia, but the charge was dismissed. June of 2005 – Bland was stopped by police in Oakbrook Terrace and charged with two traffic violations: Driving too fast for conditions or failure to reduce speed to avoid an accident, and operating an uninsured motor vehicle. She pled guilty to both charges; was given supervision, and paid a fine. June of 2004 – Bland was charged by Elmhurst police with one count of retail theft of less than $150. She pled guilty to that charge in August of 2004; paid a fine; and was sentenced to community service and supervision.